In Dublin, however, commencements rose by eleven per cent as demand for housing in the capital bounces back. 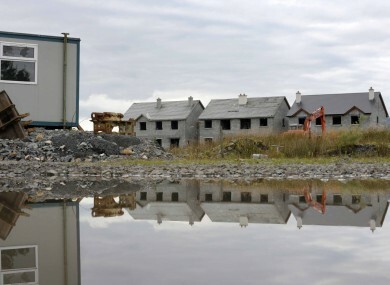 THE NUMBER OF houses being built in Ireland fell last year it has been revealed. The National Housing Construction Index shows that overall planning applications were down by five per cent and actual project commencements were down seven per cent. In Dublin, however, commencements were up 11 per cent as demand for housing grows in the capital. The 2013 figures do a show a slowdown in the rate of decline, however. Nationally, the downward trend from 2012 continued for 2013, however six counties managed to buck this trend by registering increases in the number of planning applications. Kildare (up 11 per cent), Dublin , Wicklow (both up seven per cent), Carlow (up six per cent), Kilkenny (up three per cent) and Monaghan (up one per cent) recorded increases – an improvement on 2012 where only one county (Donegal) registered an increase. The largest fall in applications for 2013 was registered in Leitrim, where applications fell by 40 per cent. According to the Danny O’Shea of Link2Plans, who compile the index, the decline isn’t as bad news as it might seem. Email “Housing applications and commencements fell nationally in 2013”. Feedback on “Housing applications and commencements fell nationally in 2013”.